Facebook is “the most important mechanism facilitating the spread of fake news” and its efforts to curb the spread of fake news through fact-checking are unlikely to succeed, according to a new study. The 2016 election saw the rise of fake news websites which distributed fabricated information packaged to appear as legitimate news articles. The study, released last week by the political scientists Andrew Guess, Brendan Nyhan, and Jason Reifler, examined web traffic data collected from the computers of a national sample of Americans from October 7-November 14, 2016 — a period which includes the final weeks of the 2016 presidential campaign — in order to map who consumed fake news and which platforms helped spread it. The political scientists estimated that more than a quarter of American adults visited a page on a pro-Donald Trump or pro-Hillary Clinton fake news website. Most of the fake news was pro-Trump, and people who supported his campaign were significantly more likely to visit fake news sites than people who supported Clinton. 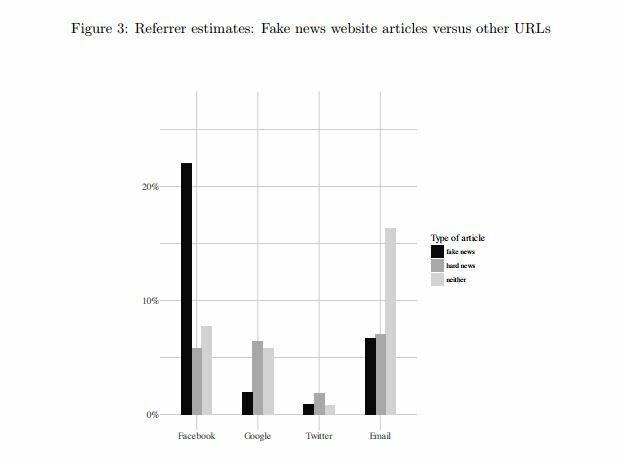 The authors highlighted the role of Facebook in propagating fabricated information, reporting that “heavy Facebook users were differentially likely to consume fake news, which was often immediately preceded by a visit to Facebook.” Fake news consumers were much more likely to be referred to those sites from Facebook than from Google, Twitter, or email. Last month, Media Matters named Facebook CEO Mark Zuckerburg our Misinformer of the Year, noting Facebook’s central position in the fake news infrastructure and its repeated failures to respond.